Choice of two systems to enhance workers' mobility by providing an air source that can be transported within a work site any time an air-line device is required. Systems are compatible with MSA's complete line of cylinders,providing versatility for users. Integral check valve on both systems allows air supply to be switched between air sources,providing uninterrupted air flow as a depleted cylinder is replaced with a fully charged one. Both systems are designed for use with pressure-demand supplied-air respirators, including dual-purpose self-contained breathing apparatus. Both systems feature Quick-Disconnect assembly for ease in connecting air-supply hoses to the air source. The Portable Air-Supply Systems consist of (1) the PortAire Portable Air-Supply System and (2) the TransportAire Portable Air Supply System. The PortAire System holds two standard SCBA air cylinders to provide firefighters, industrial personnel, confined space workers, and other wearers of respiratory protective equipment with a portable, compressed air source any time an air-line device is required. Designed for use with MSA pressure- demand supplied-air respirators, including dual-purpose self-contained breathing apparatus (SCBA), the PortAire System consists of a compact air-pressure regulating system housed in a lightweight,yet durable, anodized aluminum frame. The rugged frame protects cylinders, holds up to 100 feet of air-supply hose and serves as a carrying device for user convenience. It can be easily attached to a twowheel dolly for even more maneuverability. 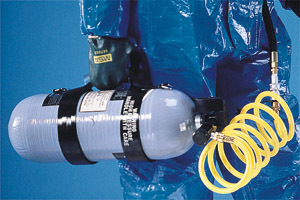 When connected to two air cylinders, the system provides a continuous supply of respirable air. During use of the PortAire System, cylinders can be refilled or changed as required to provide a long-duration air supply. When one cylinder's air supply is exhausted, the device's integral check valve allows users to switch over to the second cylinder without interrupting air flow. The PortAire System also can supply two users simultaneously. The PortAire System is designed for use with either two low-pressure (2216 psig or 3000 psig) or two high-pressure (4500 psig) cylinders. For added convenience,cylinders can be refilled without removal from the carrying frame using the optional Quick-Fill System accessory, which eliminates the need for cylinder changeover. The Quick-Fill System also allows users to connect to a cascade system or high-pressure compressor,providing an even longer-duration air supply. The TransportAire System consists of an impact-resistant handle with nylon straps that fit around an MSA 30-,45-, or 60-minute low-pressure (2216 psig or 3000 psig) or high-pressure (4500 psig) cylinder purchased separately. The system is designed for exclusive use with MSA supplied- air respirators equipped with a dual-supply option. 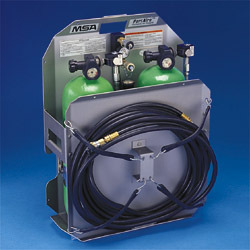 A major advantage of the dual-supply option is improved mobility,because workers need not remain tethered to a single air-supply hose throughout a work period.To accommodate this option, the dual-supply manifold on MSA respirators features two air-inlet ports: a MAIN inlet and a DUAL-SUPPLY inlet. Both are used to deliver respirable air to the user whenever connected to a pressurized air source. With the dual-supply capability,users can connect from one pressurized continuous air source to another without losing continuity of air flow. After the first length of airsupply hose has reached its limit, the wearer simply plugs into a second approved air source and disconnects from the first.This technique is known as "leap-frogging," because it gives workers the ability to move from station to station without disrupting the supply of air. Whether a worker is using the "MAIN" inlet of the manifold, the "DUAL-SUPPLY" inlet, or both inlets simultaneously, the respirator will provide supplied-air respiratory protection as long as the user remains connected to one of the two air sources. With the TransportAire System connected to the DUALSUPPLY or MAIN inlet of the manifold,a worker can carry the portable air supply to a location where the second air source is available for longer-term use. After connecting the second air source into the open inlet of the manifold, the user can disconnect the TransportAire System and keep it available until it is time to exit the area.